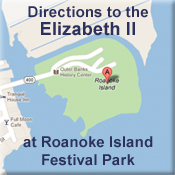 Friends of Elizabeth II is a non-profit organization that is dedicated to supporting the representative 16th century sailing ship, the Elizabeth II, and Roanoke Island Festival Park, the Elizabeth II’s home port. The Friends was first established in 1982 and is now entirely funded through donations, memberships and profits from the Museum Store on Roanoke Island Festival Park, which is located directly across from historic Downtown Manteo. Whether you’re here to learn about the fascinating history behind the origins of the Elizabeth II, find out more detailed information about our organization, pick up one of the unique gifts available at our Museum Store, or discover the many important ways you can get involved, you’ve come to the right place! Please join us in our adventures…and help be a part of history that’s still in the making!